To unify and enforce all engineers to write in a unified manner, BELLATRIX comes with two static analysis modules for helping you to apply coding standards and item templates for generating standardized page objects. BELLATRIX comes with two static analysis modules for applying coding standards. BELLATRIX comes with two modules for helping you apply coding standards in your tests- .editorconfig and StyleCop. The EditorConfig project consists of a file format for defining coding styles and a collection of text editor plugins that enable editors to read the file format and adhere to defined styles. 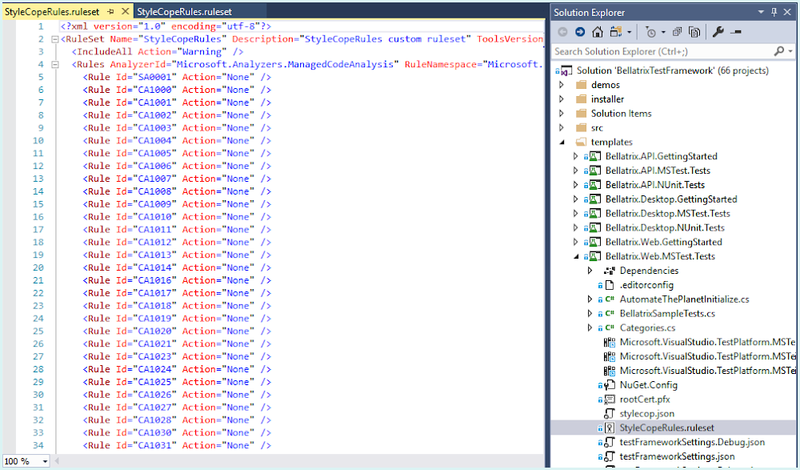 StyleCop is an open source static code analysis tool from Microsoft which checks C# code for conformance to StyleCop’s recommended coding styles, a subset of Microsoft’s .NET Framework Design Guidelines. 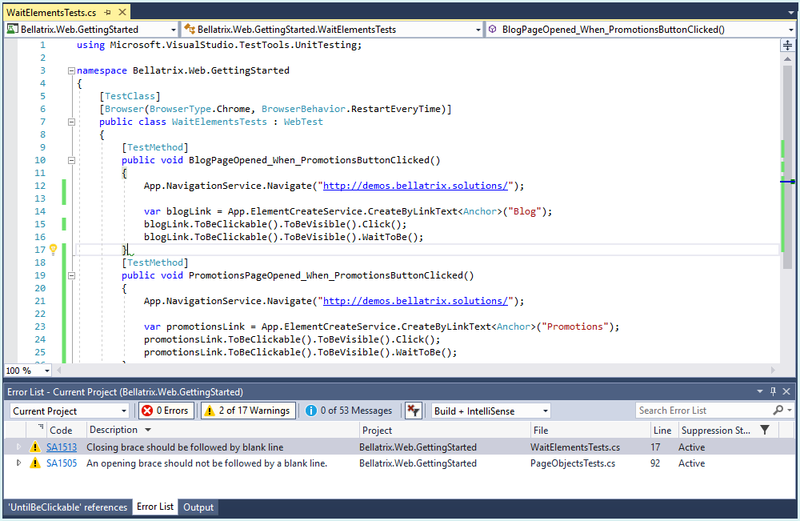 Static analysis integrates with all versions of Visual Studio. It contains a set of style and consistency rules. The code is checked on a build. If some of the rules are violated, warning messages are displayed. This way, you can quickly locate the problems and fix them. All BELLATRIX projects come with predefined StyleCop and .editorconfig rules. In the files, you can enable and disable particular rules and configure the severity of violations reported by individual rules.